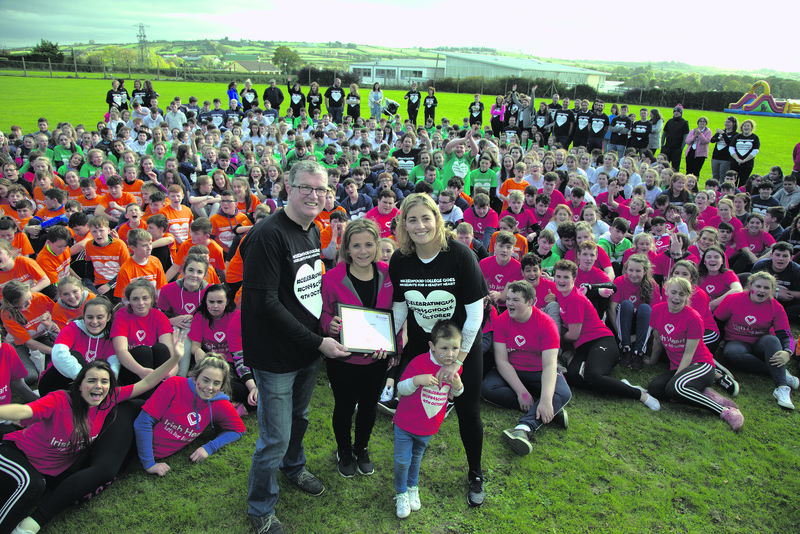 Tuesday October 9th was a truly remarkable day at Hazelwood College, Dromcollogher. It was the day that had been allocated to promoting overall health in its pupils and staff, a day of wellness, mindfulness and, most critically, CPR training. 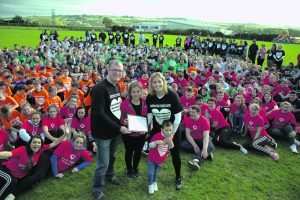 The date was chosen because it marked the second anniversary of a life-changing event for one of the teaching staff, Michelle Herbert. Two years previously, Michelle had been playing a camogie match with her team when she suddenly suffered a major cardiac arrest. Michelle, a young mother in the prime of life and active in sports, had no previous history of heart ailment. Fortunately, the fast thinking and actions of people who were trained in CPR saved her life. She made a full recovery and is actively promoting Heart Health and CPR training since that fateful day. Her school is one of the most forward-thinking when it comes to the health of pupils and staff. It has actively become involved in many aspects of general, physical and mental health. It recognises the value of training pupils in CPR skills and indeed, having almost six hundred pupils means that the surrounding areas benefit from having so many trained in vital CPR knowledge. Entering the college, I was immediately struck by the tranquilty that seemed to surround the school. With over six hundred people in attendance, going from room to room and event to event, I had expected noise. Even though there was lots of chatter and laughter, the predominant feeling was one of peace and calm. Pupils were ready to greet guests with a goody bag and a smile. The college was festooned with red and white balloons, and pupils all bore a “tattoo” of a happy heart. Every student from first year upwards was totally engaged and immersed in the day. The classes were distinguished by the tee shirts they wore, all different colours denoting their year and all having different sponsors printed on the back. But every shirt bore the logo “Celebrating Us, CPR 4 Schools.” There could be no mistaking of what this day was all about. It started with talks from guest speakers. Clare Scanlon spoke of the loss of her son Darragh six years ago who died from Sudden Adult Death Syndrome at the age of fifteen. The bravery and emotions of her words were felt by everyone. Sarah Jane Joy, a nurse and one of the team players who performed CPR the day Michelle Herbert’s heart stopped, also spoke of the importance of having properly trained people to act swiftly in a situation that could spell life or death. Podge Collins, a Clare footballer, spoke of the importance of overall health in sports. After others had addressed the assembly, students went to different classrooms to take part in a varied but valuable day of life skills. Class options included Yoga, Pilates, Meditation, Physical Training, Mindfulness, Cookery Demonstration, Nutrition, Integrated Energy and Bio Energy therapy, Reflexology, Behavioural Coaching, Physiotherapy, Fitness and Performance training, and more. But throughout the day, CPR training continued for everyone with experts of the field. Clinical Support workers from Jigsaw, Limerick’s free and confidential Health Support Services for young people were also in attendance, as was George O Callaghan, CE of the School’s Governing Body, Limerick and Clare Educational and Training Board. The list of profess-ionals involved in the day was truly impressive. They included Jim McNamara, organic horticulturalist, Limerick Youth Service, Pat Dillon, Energy Healing practitioner, Anne Herbert, Reflexologist, Lisette Nolan, Behavioural Coach, Noelle Crehan, Nutritional Therapist, Monica Cody, Mindfulness Instructor, Aoife Hannon, Physio-therapist, Bríd Quaid, Pilates instructor, Michéal Rowsome, artist and mindfulness practitioner, Michael Fennelly, Masters of Sports science, Kilkenny hurler, and lecturer in LIT, Tony Griffin, CEO of Saor Foundation, Jessie Barr, Olympian, Aidan O Brien, Fitness Instructor, Mark Doe, award winning Chef, Anthony McGuire, past pupil of Hazelwood, now a fitness instructor, Ian O’ Connor, Yoga teacher, Neil Kelders, RIPmovement.com, Sarah Cory, Yoga teacher, Darren Roche, past pupil and musician and mindful-ness practitioner, Bernie Burke, Reflexologist, Eoin Sheehan, Chef at Country Munch, Vesco Bondov, Meditation expert, Heidi Giles, Mindfulness, Paula Dalton, Oral Health Education, Pat Mulcahy, Ballinwillin House Farm, Sarah Carey, intercounty camogie player and Limerick captain, The Arena Gym, and a very special guest in the guise of the Liam McCarthy Cup! But it is to their credit that every one of these professionals gave their time and effort freely. Nobody was paid for the day’s work. Amid all this, there was a continuous stream of supporters and friends of the school working to make teas, coffees, and serve food to everyone. A barbecue was set up on the grounds, and as a treat to pupils and ice-cream van was also waiting to serve. The Irish Heart Foundation Mobile Unit was ready to take blood-pressure readings for anyone who wished to avail of the service. Interestingly, three visiting teachers from St. Andrew’s school in Blackrock, Co. Dublin also attended classes and CPR training. Maeve Costigan from St. Andrew’s told me that the purpose of their trip to Limerick was to try to roll out a similar programme in their school. “It’s my first day ever training in CPR, and I’m so impressed by the skill of the pupils here,” she told me. “The hope is that all schools will take part in CPR training” she said. There can be no doubt about the benefits of extending a holistic view of overall health, physical and mental, to students. Congratulations to Hazelwood for instigating such a view, and for leading the way to a more positive way of life.